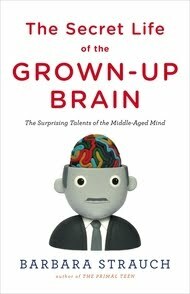 Last week, I finished the most interesting book -The Secret Life of the Grown-Up Brain, by Barbara Strauch. It's a popular examination of what happens to our brains as we age - the good, the bad and the ugly. I was surprised to learn that while the Mad Cow keeps me from remembering the names of people I know (or know of), the companion aspect of my aging brain is that I'm apparently smarter, happier and more creative. * Do I think as fast, or learn as fast as I used to? No. Is my short-term memory comparable? Hell, no. But now that the increased skills have been brought to my attention, I'm finding that it really is true - once I DO learn something, I'm able to use that knowledge in a more creative way, applying it in unexpected ways that would not have occurred to me when I was young and considered myself the smartest kid on the block. Since the ability to apply my learning in a more diverse way is a gift from my middle-aged brain, I guess I can't complain TOO much about my chronic inability to remember things on a short term basis. Of course, I'll forget about that rationalization within the hour and complain anyway, so there you go. Ms. Strauch also talked about things people can do to enhance our brain's performance over the long haul. I was already aware of most of them - education, aerobic exercise, maintaining an active intellectual life - and I think I'm pretty good about ensuring I take pretty good care of my noggin. I admit I'm a bit OCD about this issue - the thought of "losing my mind" is, quite frankly, the scariest, most horrifying health outcome I can imagine. I'd rather suffer through anything - ANYTHING - than suffer from dementia. So this book gave me some hope. If you're over 40, and concerned about your mental faculties, I'd recommend this book as an avenue to continued intellectual and mental health. If you can remember the title, that is. *There's no doubt in my bovine spongiform encphalopahy riddled mind that my Hot Mom is currently reading this from Northern Colorado and just laughing and laughing. Because, of course, she's known this to be true for years. It's funny how your parents get smarter and smarter as you get older and older, isn't it? the thought of "losing my mind" is, quite frankly, the scariest, most horrifying health outcome I can imagine. "The Brain Life Of The Grown-Up Secret" by Hanna-Barbera. Got it. Some kind of mystery starring The Flintstones, I guess. Say, anyone remember when TV only had three or four channels and you had to put foil on the rabbit ears? These kids today with their iBerries and ZunePods and Halo3 don't know what it's like to have to work to get your television operating, they just go beepbeepbeep on their pagers and watch their Lady Googoo videos without having to twiddle anything. Also, their clothes and all that noise they call music and my back hurts. Seriously, though: it's strange to me that I'm reasonably happy these days. I was a miserable youth, and the experience of being not-miserable is just... novel. If it's the brain aging, it raises a couple of questions. The first is whether it makes any sense to go through the old, "If only I'd known then what I know now business"? Maybe it wouldn't matter because even if I'd known it I wouldn't have been able to use it. Second, it makes you wonder how much adolescent "depression" really can be "grown out of," and should that have implications for treatment, particularly so far as pharmaceuticals are concerned. I'm not offering a hypothesis or argument of my own, mind you, just asking the questions. Eric, those are interesting questions, and things that have crossed my own holey brain. Well, if the grown-up brain is sponsored by Hanna-Barbera, that certainly explains why Jinx has been chasing Pixie & Dixie through the Swiss cheese up there for all these years! !